17 July, 2017, New Delhi: The introduction of GST has been one of the biggest reforms in the Indian taxation system. Post 1st July 2017, retailers have had to make quite a few changes to their billing system to comply with the new norms. This had led to confusion and others challenges amongst consumers. Many consumers reported on LocalCircles’ Connected Consumers circle that they were being charged above the MRP by some retailers and also uploaded the bills of the purchase as proof. 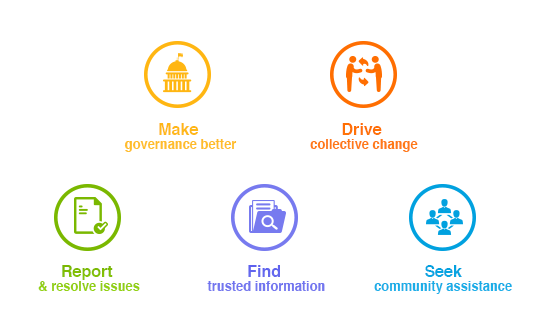 As a result the issue was caught early by the Department of Consumer Affairs and legal metrology inspectors are now in the field creating awareness and taking actions as necessary. 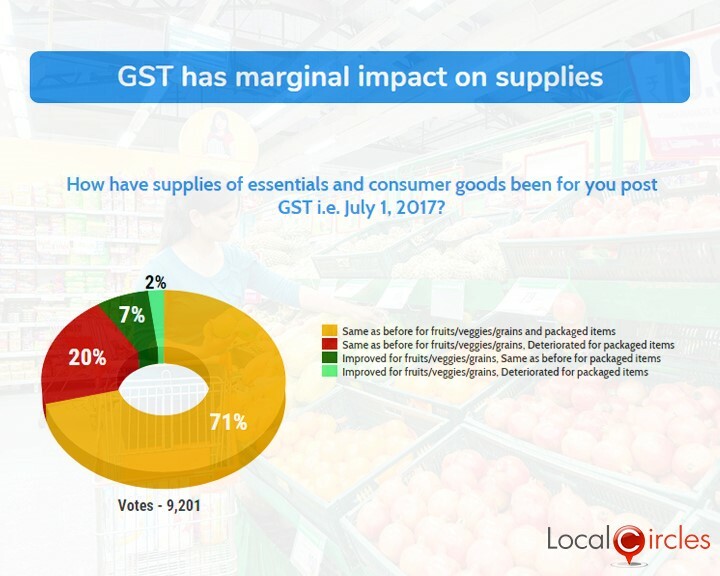 LocalCircles has conducted multiple polls in the first fortnight of GST to ascertain the effects of introduction of GST on the consumers. 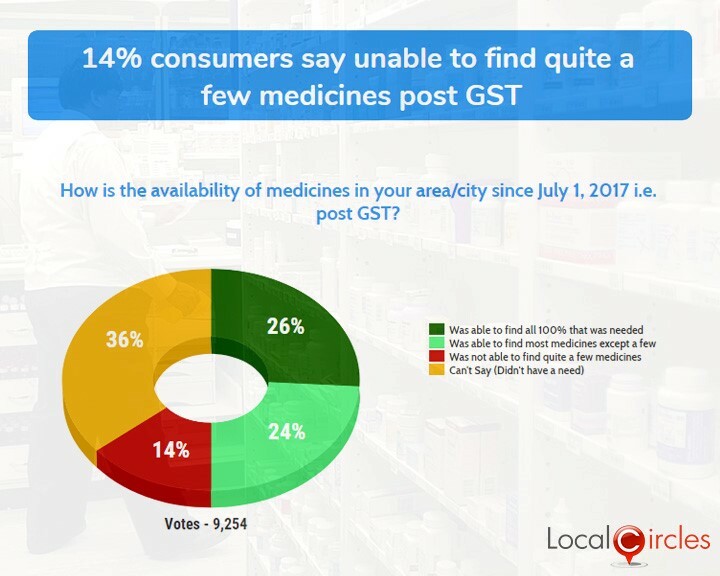 The first poll asked consumers if the availability of medicines was affected in their area since July 1st. Of the 9,254 responses received, 24% said they were able to find most of the medicines and 26% said they were able to find all the medicines that were needed. 14% replied saying they were unabble to find quite a few medicines in their area and 36% were not sure about it. Consumers have also reported that medical store have seen a shortage in supply of medicines from the distributors in the last week. 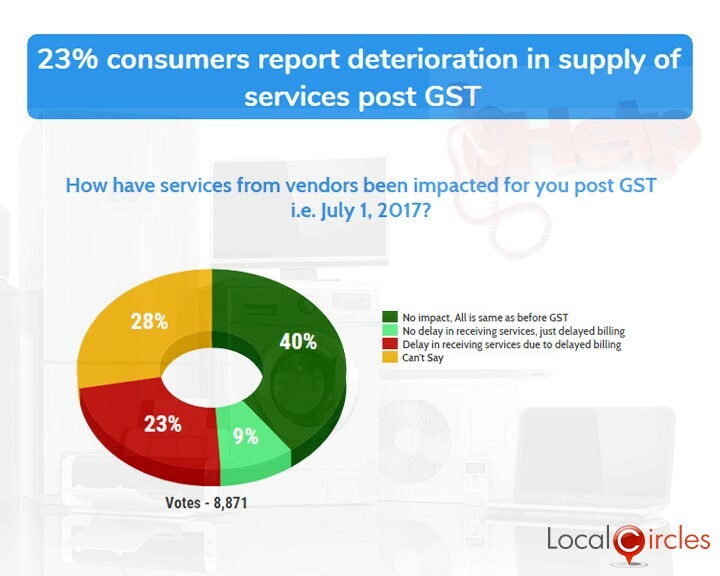 The second poll asked if after sale, AMC and related services from vendors had been impacted post GST coming into effect. In response 40% said there was no impact and 9% said there was no delay in receiving services but a delay in billing. 23% consumers reported delay in receiving services due to delay in billing and 28% were not sure about it. 8,871 consumers voted on this. Consumers have reported that several companies contacted by them for after sale service took the service request but citing GST for much longer than usual processing times. Consumers have reported that companies like Samsung have been taking 5-6 days to attend to service calls which would typically be addressed in 1-2 days. 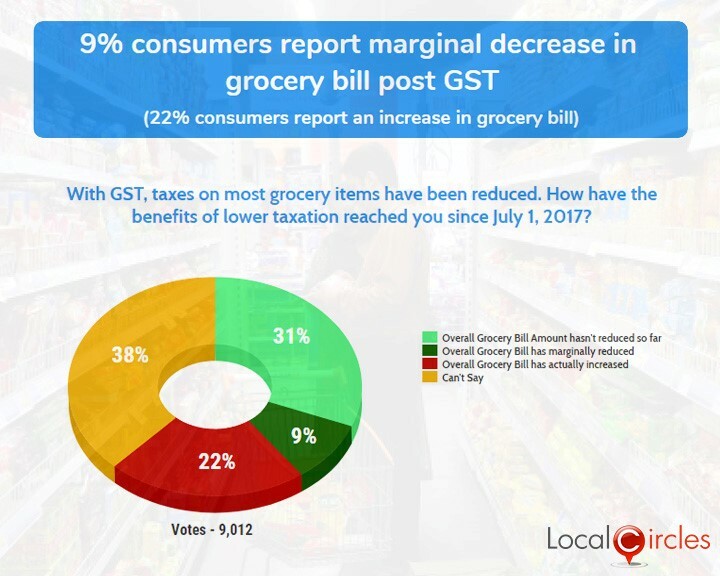 In the third poll, consumers were asked about change in grocery bills post GST as taxes on most grocery items have gone down. 22% said their bill had actually increased. 9% consumers said that their bill has reduced and around 31% said their grocery bill has not reduced so far. 38% were not sure about it. A total of 9,012 votes were received on this poll. Consumers are reporting that vendors are not reducing the prices of the products on which tax has reduced post GST and still selling them at the old MRP. This is resulting in more money coming out of the consumers pockets and more profits for the vendors. Items where GST has led to a price increases are being passed to the consumers at a higher MRP. Also, some of it may be due to the fact that recalibration in the retail billing software to account for a lower GST is not complete. 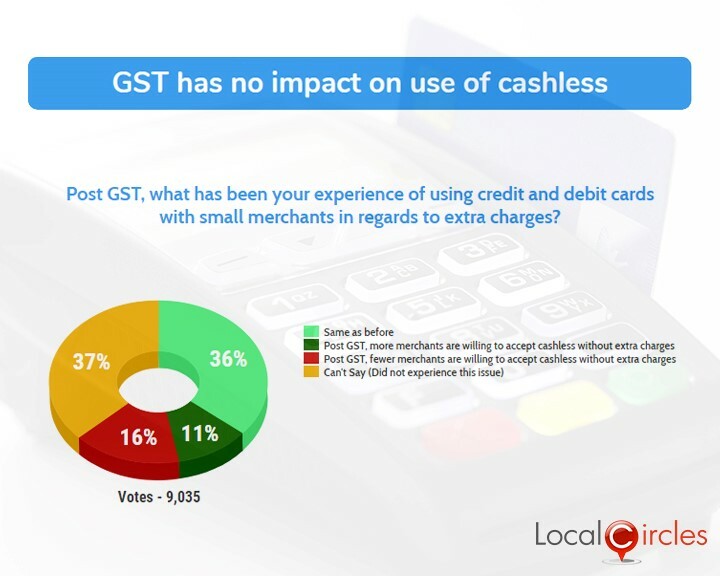 In the fourth poll, citizens were asked what has been their experience of using credit and debit cards with small merchants in regards to extra charges post GST. In response, 36% said the situation was same as before and 11% said more number of merchants were now willing to accept cashless without extra charges. 16% citizens said that fewer merchants are willing to accept cards without extra charges. Out of the 9,035 people who polled on this question, 37% said they have not had any experience with this issue yet. The fifth question asked citizens if there was any difference in the kind of purchase receipt they were receiving as a consumer. 14% said less handwritten receipts were being given than before and 47% said there was no change. 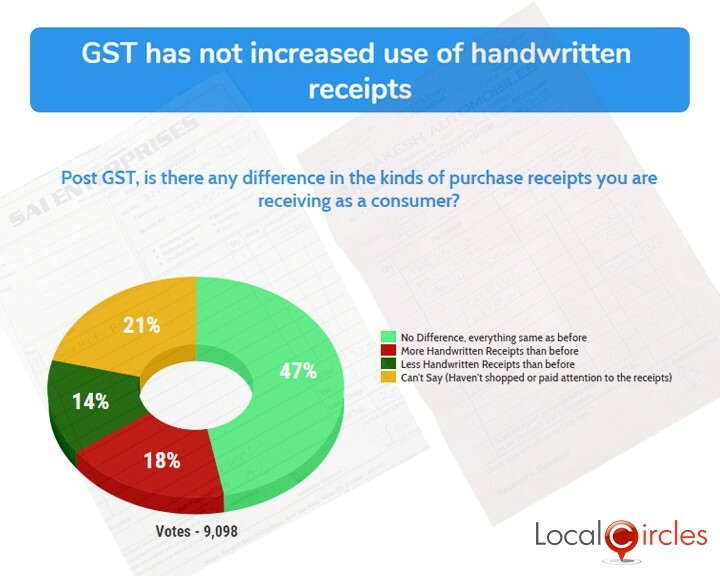 18% said more handwritten receipts were being given and 21% were not sure about their answer. 9,098 votes came in for this question. The sixth poll received 9,201 votes, around 22% consumers reported a deterioration in the supply of packaged goods post GST. 71% said the supply is same as before and 7% said it has improved in some cases. This means that only a minor disruption has happened so far in the supply chain of packaged goods. 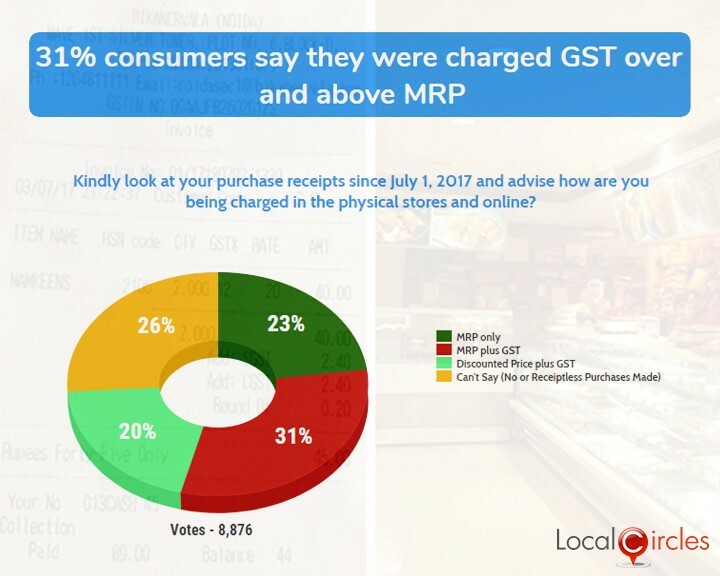 In a separate LocalCircles poll of 8800 consumers conducted last week, 31% said have been charged GST over and above the MRP of the product. 23% said they were charged MRP only. 26% had made receipt-less purchases or no purchases. In the same poll, 20% consumers said they were charged GST above the discounted price. Sellers have been trying to attract customers by offering attractive discounts but charge GST on the discounted price making the final selling price go higher. While the issue of GST over MRP has been acted upon by the Department of Consumer Affairs, Government of India, it does appear that the issue of GST on discounted MRP neds urgent attention and clarification. Many consumers had also shared receipts and an analysis by LocalCircles indicated that while in some cases GST is being charged above MRP or discounted prices, in many cases, the detailed information of tax charged in the invoices is also leading to consumer confusion. Many consumers are thinking that GST has been charged above the MRP but in reality it is just the tax break down and the final invoice amount is sum of all MRPs.